As a private school, Mercy depends on the generous donations of our parents and supporters to continually make improvements & grow. Every dollar goes back into the school, our programs, and our services for our students. The Annual Fund supports our school’s programs and services, provides classroom resources, helps to maintain and improve our school’s daily operations and so much more. Our school depends on our ability to reach our campaign goals each year, so your support of the Annual Fund is critical to our mission. Materials for the Annual Fund are mailed in the fall. You can make semi-annual, quarterly or monthly payments if you desire, as well as a one-time gift. If your company matches donations, that is an easy way to double your contribution! You can also give online through the site. After each fiscal year, we publish an Annual Report to highlight our accomplishments and to show how we are good stewards of donors’ generous contributions. Feel free to download the most recent Annual report below. Amazon Smile allows you donate 0.5% of the price of your eligible online purchases to Mercy. Simply shop online at smile.amazon.com throughout the year and select Mercy School for Special Learning as your charitable organization. Collecting Box Tops is a simple and easy way to raise money for our school! All you have to do is cut out Box Tops from participating products and turn them into Mercy. Or you can collect e-Box Tops through https://www.boxtops4education.com (you will need to create an account). For BJ’s and Costco’s sites, we have provided a password that will enable you with an opportunity to win additional e-Box Tops. Thanks for your support! Mercy has several fundraising events each year that our students, staff, and supporters look forward to. Follow our Parent Alliance page for all current fundraiser information. Our annual Dinner Gala and Auction is our school’s largest fund-raising event. The Gala features both a live and silent auction, a dinner program in which we honor someone who has demonstrated a heartfelt commitment to our students with the Angel of Mercy Award and a memorable dance performance by our students and alumni. The Golf Classic is held the first Monday every year in August. It is the second-largest fundraising event that we have at the school, second only to the Gala. Golfers enjoy a morning or afternoon round as well as prizes for Closest to the Pin, Longest Drive and top foursomes for both men and women. The Golf Classic is planned and organized by a dedicated volunteer committee. Casino Night has been an annual event co-sponsored each March by both the Parent Alliance and the Board of Directors. This year, Mercy will be hosting our Spring Social for family and friends. Please see the link for details. Stay tuned for information regarding Night at the Races, 2020. Mercy has participated in the Lehigh Valley Highmark Walk for a Healthy Community since 2013. The event gives Mercy participants an opportunity to raise money and awareness for our school by forming teams, collecting donations pre-event and then walking either a 3-mile or 1-mile fun lap. The best part is that every penny raised by walkers goes directly to Mercy – 100 percent! If you are a grantor interested in supporting Mercy or if you know of, or work for, a corporation or foundation that bestows grants to nonprofit organizations like Mercy, please contact us. 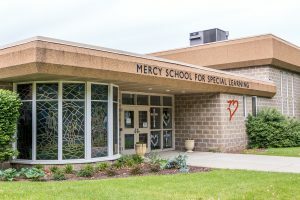 Mercy receives funding from companies through two state tax-credit programs. The Educational Improvement Tax Credits (EITC) and the Opportunity Scholarship Tax Credits (OSTC) allow businesses that pay certain taxes to direct these monies to their charity of choice such as Mercy. The Diocese of Allentown’s Eastern Pennsylvania Scholarship Foundation (EPSF) collects EITC and OSTC funds and allocates them to schools throughout the Diocese if those schools are not specifically designated by the donating business. Every cent of an EITC or OSTC contributions goes directly to the school designated by the business donor. The application process and maximum tax credits the business is able to apply for are the same for EITC and OSTC. OSTC provides scholarships for K – 12 (no Pre-K programs). There is a residency requirement for student eligibility for OSTC. The student must reside within the boundaries of one of the 15% lowest performing schools in the state as designated by the PA Department of Education. Also, in allocating the OSTC scholarships, priority must be given to students whose families are at or below 185% of the federal poverty level (family of 4 must have less than $43,000 in annual income). Planned giving provides individuals with an opportunity to support Mercy separate from our special events. Gifts of stock, for instance, can be given to Mercy via electronic transfer; the Diocese of Allentown maintains a brokerage account for the purposes of processing stock transfers to the Diocese for the benefit of Mercy and other parishes and schools. Making a gift to Mercy through your will or living trust, meanwhile, gives you the immediate satisfaction of creating a lasting and personal legacy that ensures our school’s future. If you or someone you know can donate any of the following items on our Wish List to our school, we would greatly appreciate it. To all who support Mercy School for Special Learning.